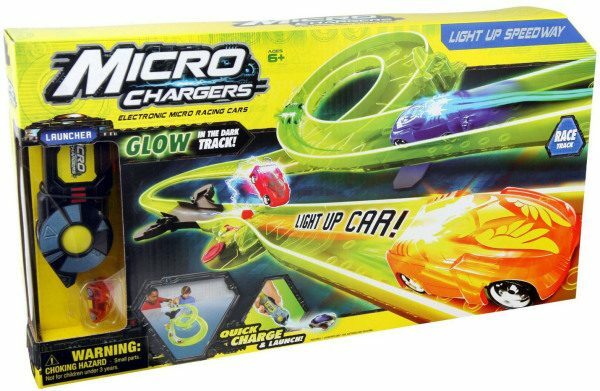 Micro Chargers Light Up Speedway Only $9.03 (Reg. $25) + FREE Super Saver Shipping! You are here: Home / Great Deals / Amazon Deals / Micro Chargers Light Up Speedway Only $9.03 (Reg. $25) + FREE Super Saver Shipping! Check out this SUPER fun gift idea – get this Micro Chargers Light Up Speedway for just $9.03 (reg. $25)! And, you’ll get FREE shipping with Super Saver Shipping! This would be a fantastic gift idea for the little racer in your life! It’s Micro Chargers like you’ve never seen before! Switch off the lights and watch the all new glow in the dark racing action!